-20160806 - More comments and notes added about my thesis Version 1; updated resume uploaded. Need some custom work done? See my Custom Embedded Systems Work page. Click here if you're looking for my Contact Me: Feedback? Corrections? page. "The Goal of a Lifetime"
My name is Gabriel Staples. 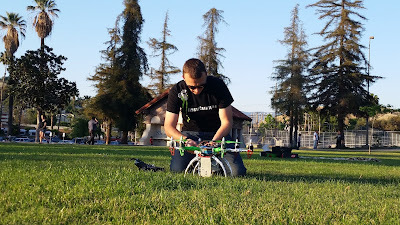 I strive to make a positive difference in this world by means of robotics, programming, PCB design, small Unmanned Aerial Systems (SUAS) and Vehicles (UAVs), microcontrollers and embedded systems, flight controllers, sensors, electronics, mechatronics, and autonomous systems in general. 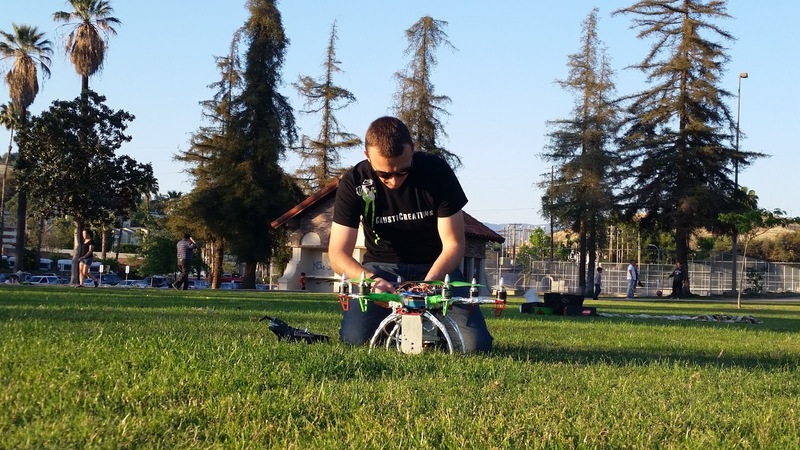 I seek to be both a thinker and a doer on a daily basis, including at work and in my personal electronics and SUAS-related interests and endeavors at home. I'm a passionate and enthusiastic engineer who loves to make things work and solve real-world problems. Some may wonder about who I am, my background and experience, etc, so here it is. I'm the owner of and engineer behind Electric RC Aircraft Guy, LLC. At the moment I'm just a one-man shop. I build the website, write the articles, do the projects, write the code, design the PCBs, answer the emails, do the marketing, etc--everything myself. If you'd like me to come work for you as an engineer, contact me, as I'm separating from the US Air Force this fall (approx. Sept. 2017), after achieving both a B.S. and M.S. degree in engineering and serving 7 years as an officer-engineer. The military provided me a great education and foundation for success, and now I am thrilled to be separating in pursuit of my engineering dreams. I thrive on using my engineering and other skills I've built up, and I fully intend to utilize all of my design engineering skills at work too instead of just at home. I'm also fluent in Spanish and conversational in French (I took 6 months French language training for 4~6 hrs/day, originally intending to move to France, in 2015) and love meeting new peoples and cultures and developing and utilizing my language skills, in addition to my engineering skills. I hope to do engineering oversees when given the opportunity too--perhaps even in Toulouse, France, Munich, Germany, or Switzerland, for instance. I'd really like to move overseas and solidify my French someday. A link to download my resume is below. You can find my email by clicking the "Contact Me" tab at the top of this website. To see some of my passion and goals, read my short blurb titled "The Goal of a Lifetime." You should also read how important it is to me to "Aim High." I first decided I wanted a Radio Controlled (RC) airplane when I was about 5 years old. Since my dad taught me about money from a young age, via weekly chores and an allowance, I had a reasonable idea just what $300 or more meant. I knew that was a lot of dumping the trash and picking up dog poop in our yard, and I knew it would take me years to save up, so that's exactly what I did...I began saving for an RC airplane at age 5. Fast forward to when I was 8, and my dad told us kids that if we each spent $100 of our own money on a baby calf, he would teach us how to raise it, and he would provide it food and shelter and shots at no cost to us if we just did the work to raise our calf and pitched in to do the work to raise several for him too. After three years of hard work and waking up at 5:30am every day to feed them, we each sold our 3-yr old "springers" (pregnant females) at an auction, for something like $1100~1300 each. By now I was 11 years old. Just like I wanted to do when I was 5 years old, I followed through with my goal by spending $550 of my total money on my first Radio Control airplane, a glow-fueled (internal combustion engine) Tower Trainer 40 (see Figure 1). With inflation, that is the equivalent of nearly $850 today (using this inflation calculator). That's a lot of money. Fast forward 14 years or so, and that hugely prohibitive cost of entry into the hobby is exactly what inspired me to write my ebook, "The Details of Electric Radio Controlled Aircraft, a Technical Perspective with an Economical Approach," here. 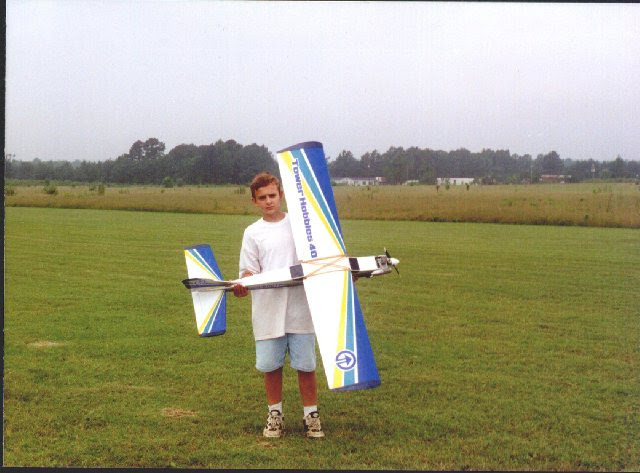 Buying that very expensive Radio Controlled airplane at age 11 is one key point in my life you might say I got my start in all of this: radio control planes, robotics, autonomous systems, engineering, Arduino, microcontrollers, programming, electrical engineering, etc. It all pertains to following my dreams from the very beginning. I learned the value of hard work and saving, and I learned what it takes to achieve a very difficult goal. For a 5 year old, that was a very difficult goal indeed. In actuality, however, my start was probably achieved at age 4 or so when I began making and collecting paper airplanes...but you get the point. I was born to follow my dreams. Or in other words, I've been pursuing my dreams since I was born. Though many failures and disappointments have come my way, I do my best to keep moving forward. It is my destiny in life to make a positive difference in our world, and I intend to follow through with that. Today I have completed many projects and have had the opportunity to participate in many things. A very small sample of those projects and things are presented here on my website. Click the "Site Map/Table of Contents" link at the top of this site, for example, to see a full list of the articles on this website, sorted by keywords. Note that a single article may be associated with several keywords, so each article may appear more than one time in the list. For a more complete list of my projects and accomplishments refer to my resume and LinkedIn profile, linked to below. 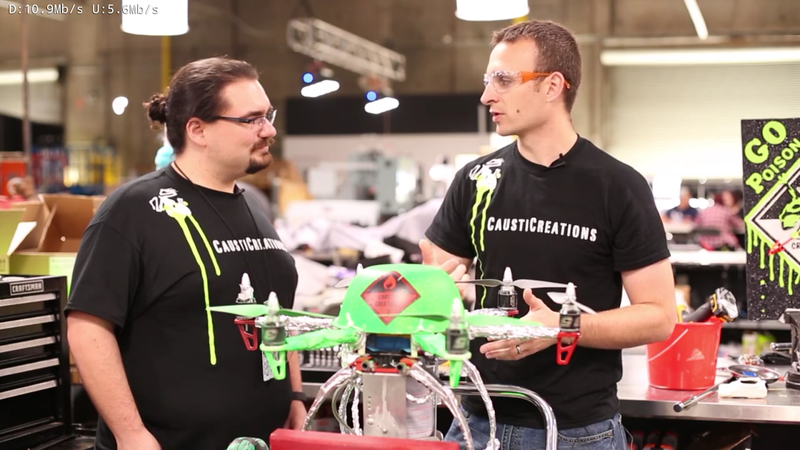 Here are a couple recent pictures of me from one of my favorite and most interesting projects--when I built Buzz the flame-throwing hexacopter for ABC's BattleBots 2016. So, this is me. It's nice to meet you! Version 1 (155 pgs): "Experimental Validation of a Numerical Model for Collimated Solar Radiation Absorption by a Rectangular-Microchanneled Surface." This is my favorite version, and the one I consider to be the most correct, as it contains my true words and points I wanted to make, including what I consider to be some very intriguing and useful numerical models and analysis I am convinced have merit and need to be included and studied further. The model does need improvement and the addition of heat flow analysis through thin-walled structures, but I think it is has great potential, nonetheless, in the analysis and study of radiation absorption. If you want to know which thesis version I think you should read and download, it's this one: Version 1. If you want to know which one was my final thesis that I graduated with, it's Version 3. This version could use some more experimental validation to look closer at my numerical model, however, as it was somewhat lacking in quantity of empirical evidence. This is also the longest version of my thesis, and, being a first cut at a complete product, is less refined than Version 3, and may have some minor grammatical, spelling, or other errors. For reasons of her own, my adviser ultimately had me cut 100 pages out of this version, including all of the numerical models and their related plots and analysis, leaving only some of my raw experimental results in the final version (Version 3). Version 2 (107 pgs): same as Version 1, except shorter. It still contained the brunt of my arguments I wanted to make, however. Version 3 (79 pgs): "Experimental Evaluation of Collimated Solar Radiation Absorption by a Microstructured Surface." This is the totally butchered version of my thesis, completely lacking the numerical models and analysis which I so badly wanted to include, and which I think provide valuable insight and should have been included. I consider that fact to be quite a shame, though that also makes this version the least risky from the perspective of possibly making any erroneous claims due to any real or perceived lack of experimental data, or any real or perceived misinterpretation of data. It is the least like my original version, and in my opinion provides less insight into the problem than the other two versions above. This version, however, is the most liked by my academic adviser. Of its 79 final pages, only 55 of them were contained in my original Version 1. Additional information was then added for clarity. Since this version was the only one reviewed by all members of my thesis defense committee, it is also the most refined. This is also the officially published version of my thesis, since it is the version read and approved by my thesis committee at the University of Colorado Colorado Springs (UCCS). Please note that in order to prevent my LinkedIn contacts from becoming diluted, please only invite me to connect on LinkedIn if you have personally met me, or had enough in depth contact with me otherwise that we can speak to each other's technical expertise. A key premise of LinkedIn is to know each other professionally at a sufficient level to provide endorsements and vouch for each other's job skills. If you are a random stranger, or a long-lost distant friend who hasn't spoken with me in ages, I will not accept your LinkedIn invites, since I cannot speak to your current job skills and technical expertise. Sorry mate, but as a retired Engineer,I'm not in the market for your services. You have made a good website! Best wishes in finding the work you are seeking. Hi! I'm using your NewAnalogRead library for a private project using the Arduino Uno. I wanted to shrink my project and use the ATmega168/328-Arduino Nano. My question: Is your library compatible with the ATmega168/328-Arduino Nano? ATmega328 Arduino Nano? Yes, definitely. ATmega168? I think so, but I haven't tried it. I believe the registers and configuration in the datasheet are the same between the 168 and the 328, but I don't have time to check, so let me say "yes", but I haven't tested it on the 168. Thanks for your comment or question! If it is a question, I will try to get back to you quickly. Notice to spammers: I personally remove all spam promptly and report spammers to Google, so please don't do it. Note: some HTML tags are allowed in your comments. To learn how to add bold (<b>...</b>), italics (<i>...</i>), or hyperlinks (<a href="URL">NAME</a>) to your comments, read here. P.S. Yo hablo español también. Je parle français aussi. (I speak Spanish & French too). "Be a thinker, and be a doer." ~Destin, from his "Smarter Every Day" series on YouTube. "Where the needs of the world and your talents cross, there lies your vocation." "Leadership is not about telling other people what to do, but about becoming the person other people turn to for help, insight and inspiration." "...and this requires being the best in your field." "It should be the end goal of any professional to reach such a high level of skill at what you do that you are no longer limited by your abilities, but rather, you are limited only by your imagination." Restoring/Recharging Over-discharged LiPo (Lithium Polymer) Batteries! Propeller Static & Dynamic Thrust Calculation - Part 2 of 2 - How Did I Come Up With This Equation? Please feel free to add questions and/or comments below the articles in this blog, and I will be happy to try and answer your questions! Copyright 2010~Present Gabriel Staples (please cite my content with at least my name & URLs). Powered by Blogger.